My five year old daughter loves to enjoy a “spa day” and have me paint her nails. Thankfully, I discovered Piggy Paint a year ago so I am able to pamper her with kid-friendly nail polishes and polish remover that won’t irritate her asthma with harsh chemicals. Piggy Paint is as “natural as mud®” because it is hypoallergenic and odor less. Piggy Paint is proud to announce that the product line is currently available at select Wal-mart locations and Walmart.com so purchasing their polish and accessories has never been easier. 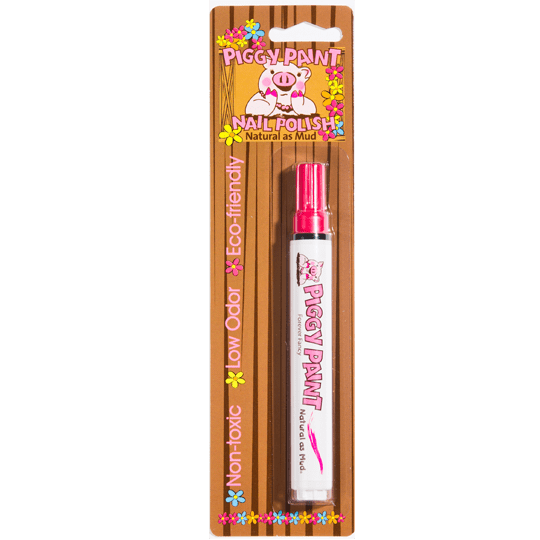 I love the new Piggy Paint colors and products that have been released for spring including “Glamour Girl” and “Glitter Bug” nail polish, nail pens and acetone-free nail polish remover. My daughter has tiny fingernails so I really like using the Piggy Pail Nail Pen ($8.99) in “Forever Fancy” for special occasions. The felt tip makes applying the polish very easy to do and it dries very quickly so that means less smudges for my active daughter. For sparkling fingers and toes, my daughter loves the new Piggy Paint nail polish colors ($8.99). Both “Glamour Girl” and “Glitter Bug” are soft colors that pop with just the right amount of glitter. These polish colors are perfect for young girls without being over-the-top. These colors are even fun for grown-ups (check out Refined Piggy Paint in “adult” colors too). I don’t normally wear nail polish on my fingernails because I don’t like the smell and it usually chips before it dries. I enjoy wearing Piggy Paint on my nails because it will air dry in about a minute and in order to make it chip-free I will neat it for one minute with my blow dryer on the lowest heat setting. I was especially pleased to learn that Piggy Paint has a low odor, no acetone nail polish remover. It works great in conjunction with Piggy Paint nail polish and I appreciate that it is hypoallergenic too. My daughter and I are both big fans of Piggy Paint and enjoy spending time together bonding over our precious “girl time”. You are invited to visit Piggy Paint to find the closest retailer to you that sells Piggy Paint and pick up your favorite nail polish colors and accessories. You won’t ever have to worry about harsh smells or toxic chemicals in your polish again! My favorite nail polish color is Girls Rule! I would like glamour girls. I love Pocketful of Posies, I would wear it myself! My grand daughter likes the Angel Kisses Nail Pen the best. My favorite color/product is dandelion dance! I like the Ice Cream Dream Piggy Polish. I like the Toe-Tally Fancy set. Tea Party for Two is my favorite color. My favorite color is Ice Cream Dream. I like the dragon tears color. Thanks! I would love to try their nail paint pens in Girl’s Rule. I’ve heard great things about their stuff. Sounds like the paint pen might actually mean my DD’s nails will last past the initial painting. My favorite is the Go with the Glow Gift Set! glow in The Dark…wow..so much fun! I love the Angel Kisses color!